I used this deck of cards because this deck is associated with manifesting and healing and seeing the Moon is in Dreamy Pisces what better time to pull them out and see what subconsciously we must do in our daily endeavor to progress in life! 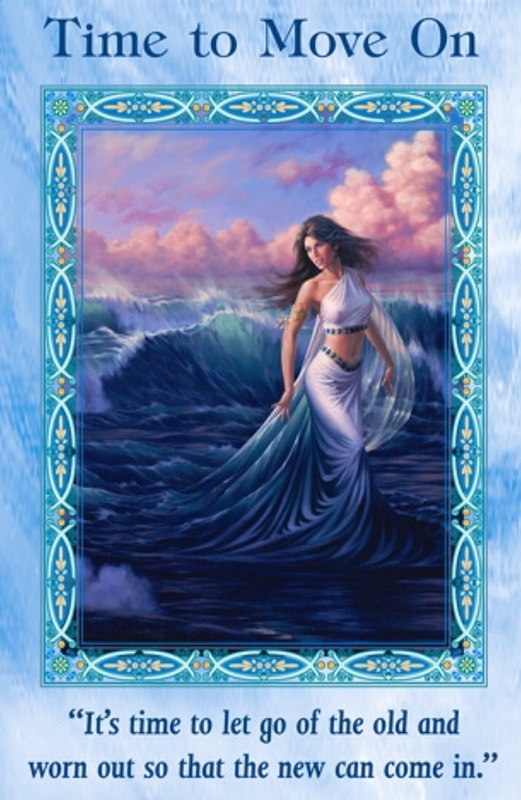 There are exciting and new things that are waiting to come into your life now.This card is to remind us that in order to manifest things in our life we MUST make room for them by letting go of the old! What in your life is taking up precious space? First step in letting go is on an emotionally and intellectually level. In other words, “say good-bye’ in your mind and heart. Once you have highlighted what needs to removed and let go of, the next step is to physical let go! This step will happen naturally, in a peaceful and harmonious way. But only once you have identified what you truly believe no longer serves a purpose in your life, it has taken up to much time, emotions, and space! Have faith and leave the rest up to Infinite Spirit. It is time to discard all the old, worn out things and patterns so that you can make space for the new and exciting gifts of abundance and manifestation.